YBCA celebrated Eiko & Koma's long history with Bay Area audiences, its venues, its community and its artists with a two week residency that included an exhibition/installation documenting their 40 year collaboration. 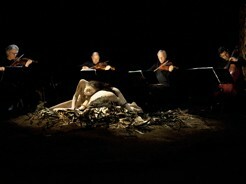 On March 15, 16, 17, Eiko & Koma and Kronos Quartet offered a four hour performance of Fragile. 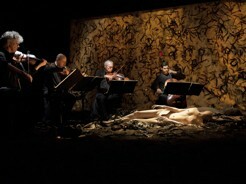 Though the piece was designed and advertised as an experience for which audiences could 'stay as long or as short as one wants," the artists were surprised to find that many people stayed to watch half or even the full four hour performance.